Mega Sale! 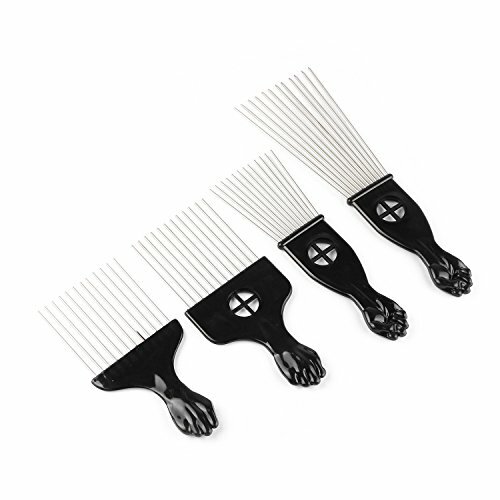 Save 22% on the WBCBEC 4 Pcs Metal Afro Comb African American Pick Comb Hair Brush Hairdressing Styling Tool by WBCBEC at Beauty Sols. MPN: unknown. Hurry! Limited time offer. Offer valid only while supplies last. Material: metal and plastic. Color: black. Quantity: 4 Pcs. Type: comb. Package Size: Approx. 11.8''L x 7.9''W. Total Weight: Approx. Package Size: Approx. 11.8"L x 7.9"W.
Package includes 4 combs, necessary pick combs for DIY hairstyle. Made of metal material, not rust, durable to use for a long time. Wide teeth, not worried to hurt your scalp and hair. Perfect for curly hair and Afro hairstyle. Adorable comb handle, classic black fist design, rich in art. If you have any questions about this product by WBCBEC, contact us by completing and submitting the form below. If you are looking for a specif part number, please include it with your message.